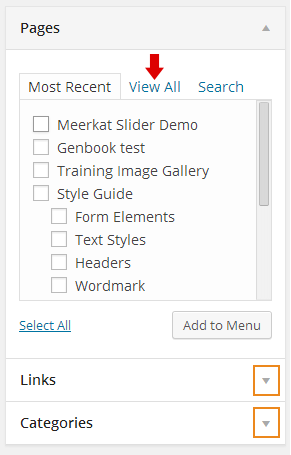 The custom menu widget is used to create sidebar menus on most sites in the Meerkat theme. On this site, you can see an example to the right called “Topics.” The widget itself has very few options- it mostly serves as a way to map a specific menu to a location in your sidebar, but can also be used to make a callout menu box. The links that appear in the menu are controlled via the menu editor, not the widget itself. Only site administrators can edit menus. 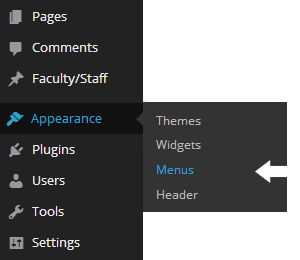 Select the Appearances -> Menus from your dashboard menu. If you don’t see “Appearances” in the left column of your dashboard, you’re probably not an administrator. You can get to a custom menu through the widget editing interface (how to edit widgets) by clicking on the “Edit Menu” link (outlined in red below) – this will take you directly to the correct menu. 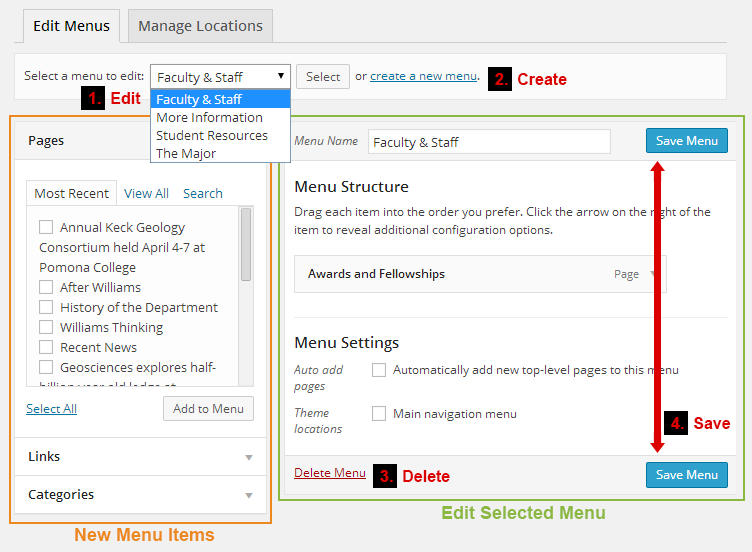 Select one of the site’s existing menus from the pulldown menu, then click the “Select” button. The menu will load on the right side of the page, in the area outlined in green above. If you clicked on the “Edit Menu” link from the widget editing interface, the correct menu should already be selected for you. Click the “create a new menu” link. Name your menu (choose carefully, because you won’t be able to rename it), then click the “Create Menu” button. Deletes the current menu. Unlike pages/posts, there’s no way to restore a deleted menu. Remember to click the blue “Save Menu” button after creating a new menu, or making changes to one. Do NOT change your menu name – it will delete the menu. 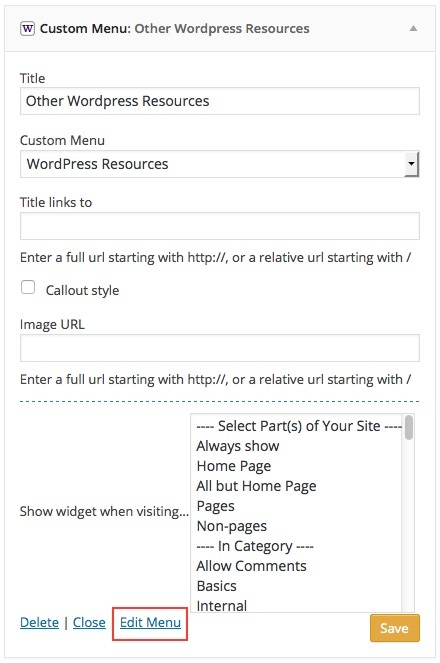 You can edit the menu’s title as it appears on your website under Appearance -> Widgets. New menu items are available in the left column (outlined in orange in Figure 1), and are sorted by type: pages, links, and categories. By default, the pages section will be expanded. To view links or categories, click the arrows outlined in orange, left. New menu items will appear at the bottom of the menu. Check off the pages you’d like to add to the menu. If you don’t see the page you want, click on “View All” (see red arrow) or click the “Search” link. After selecting one or more pages, click the “Add to Menu” button. 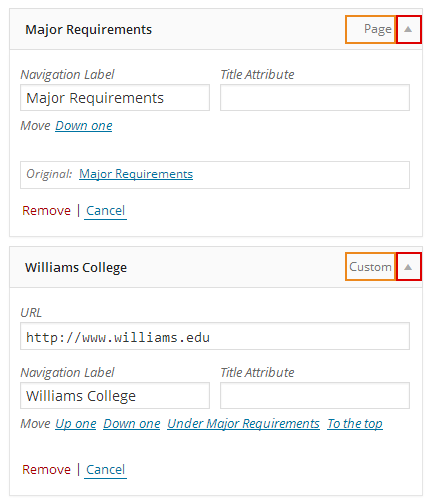 Use this to add a link to an external site (another site at Williams, or outside of Williams). Enter the full URL (including “http://”), provide link text, and click the “Add to Menu” button. Check off the categories you’d like to add to the menu. This will link to a category of posts, not individual posts. If you need to link to an an individual post, you can use the links tool. Click the “Add to Menu” button. Drag and drop menu items to reorder them. You can create submenus by dragging an item below and slightly to the right of another item (see sub item, right). To edit a menu item, expand its box by clicking on the triangle (outlined in red). The text outlined in orange will tell you which type of menu item it is (page, category or custom – a.k.a. link). Once expanded, you can delete the item by clicking on the “Remove” link in the lower left. If you change the navigation label for a page, it will only be reflected in the menu (it does not change the page’s title). If you want to change the name of the page globally, edit the page itself, and change the title there- the updates will also be reflected in the menu. If you change the navigation label, the menu will ignore any further changes to the page name. The title attribute is text that will show below the viewer’s mouse pointer when they hover over the menu item. This is particularly helpful if you’ve used an abbreviation or acronym as the navigation label (use the un-abbreviated, or full name as the title attribute), or if users might not understand where clicking on the link will take them. None of your changes will be visible until you click the “Save Menu” button. Remember to save your work as you go!